This is an elegant handmade one-of-a-kind Jewelry or Curio Box. It's made from Red Oak, Purpleheart, and Poplar Woods. The top has a distinctive horizontal stripe of alternating pieces of purpleheart and poplar sandwiched together. 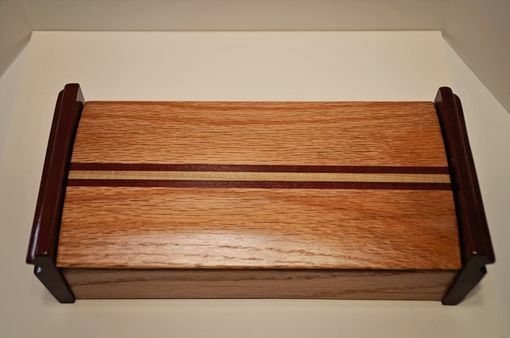 The sides are made from solid purpleheart with grooves routed across the grain. The outside dimensions are 11 1/4 inches long by 5 1/8 inches wide by 3 inches tall. The interior dimensions are 9 7/8 long by 3 7/8 wide by 1 1/2 inches deep. This box is destined to be a family heirloom due to it's sturdy yet elegant construction. It has a durable and glossy finish of Lacquer.